River Valley’s Cole Young runs along the sideline during a non-conference victory on Aug. 25, 2017, in Tuppers Plains, Ohio. Last meeting between the teams: August 25, 2017. Meigs won 14-8 in Rocksprings. Current head-to-head streak: Meigs has won 3 straight. 1. The Marauders’ last trip to Memorial Field was on Aug. 26, 2016 and resulted in a a 42-7 MHS victory, its first win in Gallipolis since the 1970s. 3. The Blue Devils were 3-2 at home last season, giving the squad its first winning season at home since 2012. Meigs was 1-4 away from home last fall, with three of its four losses coming by a combined seven points. 4. Gallia Academy has 47 players this fall, with 26 returning from last season’s 5-5 team. Meigs 2018 roster features 45 players including 22 varsity returnees from last year’s 4-6 squad. 5. GAHS was the only non-league opponent Meigs defeated last season. The Blue Devils also had just one non-league win last fall, coming in Week 2 against River Valley. Last meeting between the teams: Oct. 11, 2013. Coal Grove won 63-28 at in Bidwell. Current head-to-head streak: Coal Grove has won 10 straight. 1. The last time these teams met was as Ohio Valley Conference foes. The Hornets are the defending OVC champions and ended a 4-year playoff drought last season. 2. 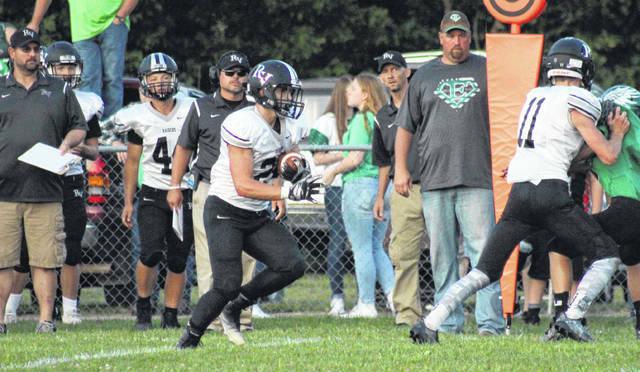 River Valley won’t have to leave Gallia County for the first four weeks of the season, with its lone road game in that stretch coming in Week 2 at Gallia Academy. 3. In addition to Coal Grove, the Raiders will also host Portsmouth, Nelsonville-York, Wellston and Vinton County this season. RVHS was 2-3 on its home field last season, making the first time in four years the Silver and Black were below .500 in front of their home fans. 4. Along with the Hornets, River Valley’s non-conference opponents this season are Gallia Academy, Portsmouth and South Gallia. The Raiders have finished its non-league slate at .500-or-better in all-4 seasons since joining the Tri-Valley Conference. 5. River Valley has 44 players on its 2018 roster, including 20 returnees from last season’s 3-7 squad. Coal Grove has 37 players on this season’s squad. 1. Both Eastern and Huntington are looking to end a stretch of below .500 seasons. The Eagles have suffered through three straight seasons below .500 and are looking for their first winning season since 2012. The Huntsmen have had five straight losing campaigns, with their last winning record coming in 2000. 2. Huntington was 2-8 last season, falling in its last four contests after being held to a average of 6.5 points in those games. The Huntsmen defeated Northwest and Westfall for their only two wins a year ago. 3. The Eagles have not started the season with a win since 2004, when they topped visiting South Gallia by a 41-6 mark. After opening the season with a loss to SGHS the following year, Eastern dropped its next six season openers to Alexander, and then lost twice each to Symmes Valley, River, and River Valley in the next six years. 4. Since the expansion of the TVC Hocking in 2010, Eastern is 4-12 out of conference. Along with the Huntsmen, EHS will face Caldwell in non-league action this season. 5. This is the first time Eastern has faced an opponent from Ross County since 2005, when Zane Trace defeated the Eagles 67-0 in Kinnikinnick. Last meeting between the teams: August 26, 2017. Southern won 41-6 in Portsmouth. Current head-to-head streak: Southern has won 6 straight. 1. The last time NDHS visited Racine was Aug. 26, 2016 and resulted in a 21-14 Tornado victory. It was the second straight one-possession game between the Titans and Tornadoes. 2. Southern has won five consecutive season openers, while Notre Dame has gone five straight years without a season-opening win. The Tornado streak began with victory over River Valley in 2013, and has featured a pair of shut outs. 3. The Tornadoes have won at least one non-conference game in each of the last five seasons. Since the expansion of the TVC Hocking in 2010, SHS is an even 8-8 in regular season non-league play. 4. Notre Dame last defeated the Tornadoes on September 19, 2004. The Titans won that game by a 34-0 count in Portsmouth. 5. Southern has 23 players on its 2018 roster, including 15 returnees from last year’s 7-3 team. Notre Dame’s 2018 roster features 26 players, up from 17 a year ago. Last meeting between the teams: Sept. 19, 2014. Symmes Valley won 19-12 in Mercerville. 1. South Gallia’s last trip to Willow Wood was on Oct. 29, 2010, and resulted in a 53-12 Vikings victory. 2. Symmes Valley is 15-1 all-time against South Gallia. The Rebels’ only victory in the series was on Oct. 13, 2006, when SGHS pulled off a 20-13 victory in Willow Wood. 3. South Gallia has 33 players on the 2018 roster, 16 of which return from last year’s 2-8 campaign. Symmes Valley — which went 6-4 last season — has 30 players, but just four seniors and three returning starters from each side of the ball. 4. South Gallia is just 6-16 in varsity season openers all-time, with a three-year losing skid entering. The Vikings have started 11 consecutive seasons 1-0, a streak that dates back to 2007. 5. Since joining the TVC Hocking in 2010, SGHS has only had one season (2010) without a non-league victory. The Rebels are 8-8 in non-league regular season play since joining the TVC Hocking, and will also face River Valley this season.